They’re best friends, this crew. Spending the days together has built a friendship unshakable in the short handful of years they’ve lived. It blesses me to watch them. To see the way the younger ones look up tot he older ones–I never dreamed it would be this good. Having the two boys back-to-back and then the girls, has made for incredible ‘built-in-friends” as I say to them. Homeschooling keeps us together, and while to some, that may seem just a tad overwhelming and all together too tiring, I assure you, you are entirely right. It is good, and the gift that comes with our close proximity for hours on end, is a togetherness that I am only just beginning to see the value in. 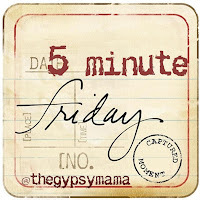 Joining Lisa-Jo and fabulous others this morning for Five Minute Friday, where we cut the words loose for just five minutes, and see where they fall. No editing, just encouraging the others who play along. Kris, your children are beautiful. And the pairing of the boys and then the girls. . . wow, such a gift. This post celebrates this joy of life with them. What a privilege. Thank you. Jennifer~ it is a privleage to parent them. I am learning that more and more!! God bless you, my friend! Oh my gosh! You have a most beautiful brood 🙂 What precious gifts you have… and your life example helps me to appreciate the value in our homeschool togetherness… too. Thank you sweet, precious friend… for being such a light! Homeschool togetehrness is quite a handful, isn’t it? But I know that when theya re all older, we will treasure these memories of time spent together, working, learning, growing… what a gift it truly is! Bless you, my sweet sister-friend. I can hardly stand it–how adorable your children are! and what a blessing to have built-in friends. I’m the 2nd of 4 siblings and believe me…if it ever parts for a phase, the friendship they’ve bonded with now will come back together. . .
Lonni~ How wonderfully encouraging your words are!! Thank you for this! I love to hear such encouraging truth, from someonewho has been where I am. What a sweet, blessed family you have.. Thank you!! It is a gift, Denise. I admit that there have been seasons where I haven’t *felt* that way. How much growing up I have had to do! God is just abundantly good and patient with me!! Truer words were never spoken, but I wouldn’t change it for the world. Love the togetherness it brings as well. love every bit of this. and can shout out a hearty “amen” to all of it, too! so privileged to be in the journey alongside you, and love your encouragement along the way. Thank you, Steph! I love to picture you shouting “amen” with me! Yeah! 🙂 God is So so good!! Watching our children grow together is indeed a blessing. Mine are separated by miles, but not love or technology. 🙂 Sometimes, the roles reverse and it’s the younger ones who help the older ones. Like the day my boys circled their older sister, the first grandchild, in their arms, supporting her (and each other) as they watched their grandfather’s body be lowered into the ground. Love this glimpse into your life and journey. It is a fun one. Oh Nita, what sweet and tender memories. I pray it is so for my children as well. I lovethe way they love each other right now, I pray it only increases! so glad you stopped by! Love it! The words and the picture! Thank you for sharing! Oh what a gift, this kind of friendship between siblings. I didn’t have any and am blessed to observe it the lives of others. The picture is just gorgeous and you are a blessed mama for sure. thanks, Shelly~ 😉 It is such a gift! sweet picture…and I can tell you…it is worth all the crazy hard times…being together…growing up under one roof all day long forges something deep in the family. My post is similar…just at a different phase of life…blessings and keep growing together. Thank you, Ro, for the affirmation, I believe you, it IS worth the crazy! I wouldn’t have it any other way! 😉 Bless you, my sweet friend! As a homeschooling mom I, too, am so grateful for the friendships my boys have forged with each other. It’s a blessing! Beautiful! There is a special bond between siblings when you are separated from “the status quo” around you….as a missionary kid, I truly get that. My sister and I STILL to this day understand each other JUST be tones of voice over the phone or a look across the room in person or random body language. Thank you for sharing them with us! It encourages me…truly! Lindsey, that’s so awesome. What a blessing to *know* each other so well. THat is just so beautiful-wonderful! Love you, friend! Beautiful. Cute pic. And yes those moments fly by WAY too quickly. My son graduates college and gets married all in less than a month. These are precious days you have to enjoy. Soak it all up!!! Oh Wow, Alene! That’s a lot of firsts all at once! Praying for you during this super-exciting time!! Oh how precious! That picture is just amazing. What a lovely, lovely tribute to the hard, long work you have invested in them by staying at home, by home-schooling. My heart rejoices with you! I love your blog. So glad I tripped on over from 5 minute Fridays. Congratulations on guest posting at (in)courage. Peace and good to you and your crew. Thank you, Chelle. I too am glad you stumbled over here 😉 Wishing you God’s peace and rest this weekend!! Oh! This is so wonderful. I’ve been home educated my whole life. I believe that being home “schooled” as well as the ways that my parents have made family time a priority has helped my siblings and I be so close. We’re the reverse of your precious family. My Momma had two girls first and then two boys. Precious family and precious post. Oh yes, Deanna. They struggle with the flesh as we all do, but they are the best of friends! 😉 I love homeschooling too! Hey Kris, love the portrait of the kids. It really is a beautiful thing, raising siblings as friends rather than competitors. It’s not an easy job. I only have one, so I worry that we’re not a “real” family yet. But we live in community, http://www.jpusa.org, so we’re building in some soul sisters and brothers for our daughter. And you’re tackling the most important aspect of that, teaching them to appreciate and love what they have in each other. Praying your community fills the gaps you feel, and bring a peaceful encouraging environment to live and raise a family. hey kris, i really like this: ” It is good, and the gift that comes with our close proximity for hours on end, is a togetherness that I am only just beginning to see the value in.”–thank you for writing your honest heart here about homeschooling–being a homeschooling mama myself, trying to learn, figuring out our groove and our moment-by-moment rhythm–i am flat tuckered out. im glad i read this. blessings, friend. Nacole, It is tiring, isn’t it? I am so done by the end of the day! It is so worth it though, all of the constant learning and growing and being stretched… I can’t imagine not doing it! Bless you, friend, hang in there!! This time of families being together… so, so important. Lovely pictures of your family, Krissie!